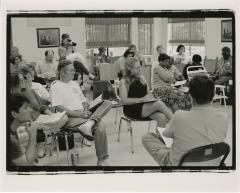 Collection includes assessments, printed materials, correspondence, newspaper clippings, press releases, and photographs. Information about the 1997 Smithsonian Festival of American Folklife. Field school records include evaluations, handouts, and reports. Fieldworker records include contracts, reimbursement requests, notes and essays. Recordings from the project are housed at the Louisiana Tech University Archives. Funded by a grant from the Fund for Folk Culture/Lila Wallace-Reader’s Digest Community Folklife Program with additional support from the Louisiana Division of the Arts, the Delta Folklife Project mainly focuses on folk traditions in the Delta parishes region, but also includes occupational, ethnic, and other types of traditions existing within the area. Roach, Susan, H.F. Gregory, and Maida Owens. 1999. “Louisiana Folklife Program: The Delta Folklife Project: An Overview.” Folklife in Louisiana. http://www.louisianafolklife.org/LFP/main_prog_deltafolkli_proj.html.